In response to an encounter with that man whose face he saw at the window, Dr. James Judge made a vow, early in his career, to be a different kind of doctor than his medical training had taught him to be. He vowed not to deny his own humanity. He vowed not to shrink from his patients' unseen suffering. He vowed he would ask the -probing and important questions, the ones that had nothing to do with an illness and everything to do with it at the same time.- And he vowed he would listen. In the years that followed, Dr. Judge kept a journal. 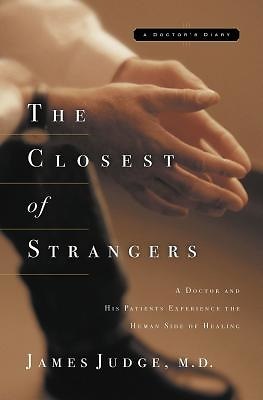 In The Closest of Strangers, Dr. Judge shares stories from that journal, stories that demonstrate the paradox of the patient-doctor relationship: that two people, essentially strangers, can somehow walk through life's most intimate moments together and, how, on that walk, they can both move toward healing. The stories inThe Closest of Strangers demonstrate the love, faith, courage, and remarkable, boundless resilience of the human spirit. Through these stories, you will be witness, as was Dr. Judge, to the powerful current of grace running through their lives-and his own. In the course of a young boy's illness, a mother grows strong, a family grows close, and a community grows tender. A woman unable to keep up the -lacquered layers of expectations- in her -perfect- world courageously faces her emptiness and learns to experience the real substance of life. To bring her baby safely to term, an unmarried teenager fights a malignant tumor and a doctor's stern advice that she abort her pregnancy. A deeply troubled man entangled in addiction finds the courage to speak honestly about himself and to call on God to help him face and overcome his demons. A mother of a profoundly disabled child remains convinced that her little girl's life holds purpose-and so, miraculously, it does. -Suffering sometimes brings with it certain gifts, - Dr. Judge writes. -Qualities and strengths beyond value or measure.- The Closest of Strangers testifies to those qualities and strengths-and to the lessons learned by a doctor who listened to his best teachers, who sometimes became his healers as well.